This particular blog entry is a continuation of a previous entry entitled “The Caboose” found on blog #10. If you haven’t read this particular entry yet, let me suggest that you do as it will give you the back story and greater understanding to this current entry. My wife and I arrived in Delaware in December 2016. It was the coldest day with temperatures dipping down to 15 degrees Fahrenheit the day we moved in. What was so significant about the low temperature became apparent when we realized the rental we now occupied, due to the low temperatures, froze up the heating system which meant we did not have any heat the first night. On our first night it reach 45 degrees inside our rental. Our agent sent someone out the next morning to have the situation repaired. I began my new director of pastoral care position at the Nemours-Alfred I. duPont Hospital for Children in Wilmington, Delaware the last day of December 2016. There were things that occurred before we left Mississippi that can only be described as “spiritual.” Allow me to explain. After I saw the words “Delaware & Hudson” on the little caboose my wife gave me as a Christmas present in 2015, I was overwhelmed with wonder. There had been other instances in my life where I heard comforting voices or a voice that gave directions that eventually became clear that I was being led spiritually. For instance, when I realized that I would have to move out of the office I occupied some thirteen years at the hospital in Mississippi, I packed everything in boxes. One Saturday my wife and I transported all the boxes to our home and placed them in our spare bedroom. As I am placing these boxes I hear a voice instruct me, “don’t unpack them.” So I left them packed. These instructions came before I knew anything about the hospital in Delaware. Once I learned about the hospital in Delaware and made application for the position advertised, there were prayers made that basically indicated my attempt to see the invisible. One of my prayers basically stated to ABBA, “if this move to Delaware is going to happen, we will have to sell our house and move up there. I don’t know if we have the funds to move that far. Its a thousand miles from here” Then I hear a voice say the following, “I will send you a buyer and I will also send the movers.” I did not know what “sending the movers” meant. As a matter of fact, it did not dawn on me that what was communicated at this point was assurance that I would fill the position. Once I accepted the new position offered to me, my recruiter called me back the next day informing me that the hospital will be moving you and your wife to Delaware at the hospital’s expense. He’s going to send the movers! An interesting note about the hospital moving us from Mississippi to Delaware came as I spoke to the one who aids me with our hospital budget. He informed me that the hospital does not move newly hired associates at my particular employment level. I simply smiled and inwardly praised and worshiped my heavenly father. I also heard in my spirit that my “caboose dream” will serve prominent in my ministry. Funny thing about a Southerner moving to the Mid-Atlantic region of the United States. Many people noticed my southern accent and asked me where I was from. When I tell them that I came to Delaware from Mississippi they often asked how I got there from Mississippi. I ask them if they really want to know. Most if not all of them say yes. So I tell them my caboose story. I bet I have told this dream story over a hundred times. The looks on their faces seem to indicate to me that somehow this dream story hooks something within them that offers a degree of comfort and amazement. As a matter of fact, the other day I was invited to visit a patient that had just been transported from our Emergency Room to one of our inpatient rooms. The patient was accompanied by her father to whom I had related my caboose dream one evening in our emergency room some three months earlier while doctors and nurses ministered to another one of his children. He invited me to come and share this dream story with his inpatient daughter and while I shared it, he recorded me telling the story. As the dream continues to unfold, I am of the belief that the young man that walked past me to shake hands with Jesus was in fact Alfred duPont. I can’t explain this to you but when I was asked by my recruiter back in the fall of 2016 if I knew how much Alfred loved trains and that there were train representations all through the hospital, it just made sense to me that somehow Alfred himself served prominent in my dream. What I am about to share with you occurred on July 14, 2017. I had been employed at this hospital for seven months. I happen to be visiting with my supervisors’s secretary Tricia. I was in the midst of telling her my caboose story when I came to the part about a young man walking past me to shake hands with Jesus. As I related this part of the dream and my wonder if this was Alfred duPont, all of a sudden she began to weep. It was a very holy moment for me. As I embraced her weeping I began to weep as well. In that holy moment I realized that it was indeed Alfred duPont and it was given to me why they were shaking hands. They were shaking hands due to a collaboration between Alfred whose name is represented on the hospital and Jesus that I would be the next director of pastoral care for the sole purpose of casting a vision for pastoral care. Then I looked down at Tricia’s desk and the picture associated with this blog entry is the picture I took that day. 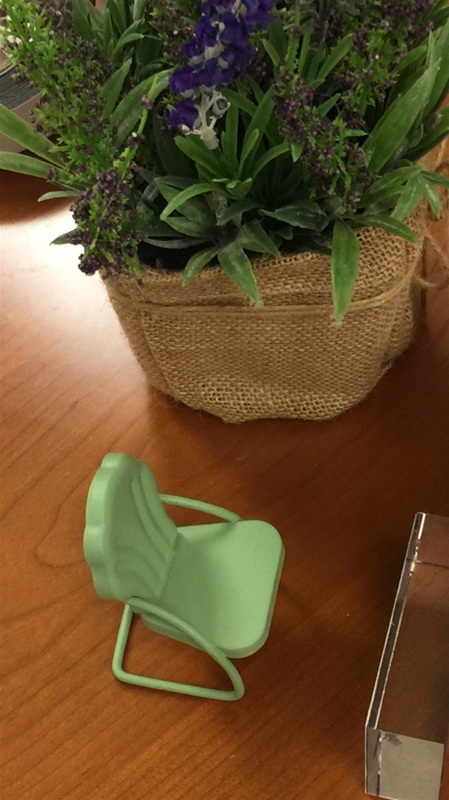 When I saw the little chair sitting on her desk I realized that my dream is continuing to unfold and the child’s chair Jesus brought on to that caboose means he really thinks a lot about children to have brought a chair just for them. There are other events that have occurred but for now I invite you to ponder what I have shared so far. There will be other entries!